1939 - 1948 Mercury 1941 - 1948 Ford Steel Fuel Gas Tank 17 Gallon. Brand new 1941 to 1948 Ford and 1939 to 1948 Mercury passenger car STEEL gas tank. Galvanized Steel For Rust Prevention, Painted Silver. Internal Reservoir Tray - Great for Carbs... Stock dimensions - 33-1/2" x 19" x 8. Accepts All 5-Hole Senders - VDO, SW, Classic, etc. Optional In-Tank Fuel Pumps Available. This heavy duty steel tank is perfect for your classic Ford project and is on sale here at a huge discount. New parts are being added daily! Whether you're a novice rodder or an experienced builder, there is something here for you! 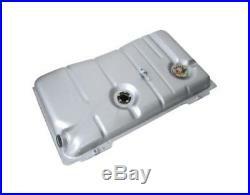 The item "1939 1948 Mercury 1941 1948 Ford Steel Fuel Gas Tank 17 Gallon 48G" is in sale since Tuesday, April 2, 2013. This item is in the category "eBay Motors\Parts & Accessories\Car & Truck Parts\Air Intake & Fuel Delivery\Fuel Tanks".